Have you ever felt like there are too many topics to research, too many articles to collect + read, and simply too much info to cite + keep track of when writing a massive research paper? As a college student, it’s not fun staying up to write a paper until the library closes at 2AM. In order to save time, I started using ReadCube. 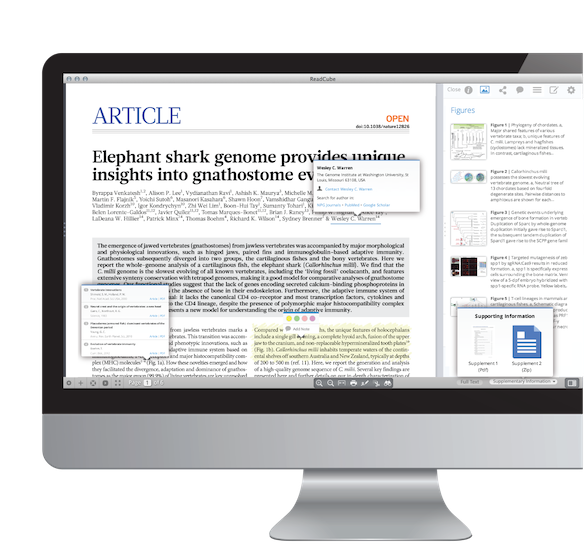 ReadCube desktop allows you to “go beyond the PDF” by using enhanced methods to read and search: if a publication can be enhanced, then you can load and overlay information from a publisher’s website with clickable inline references, supplements, and related materials. If you already have a folder of PDFs on your computer, you can import the PDFs into your ReadCube library. Similar to how you can make playlists for your music, ReadCube lets you create customizable lists to categorize your articles, or it can automatically create lists to match the name of the folder you imported. How many students agree that rereading articles can be tough, especially when the article is more than five pages? Nobody has the time for that! ReadCube helps you save time by giving you the tools to take inline notes in your own words, which makes it easier to recall information, and highlight keywords/ short sentences. I can’t even begin to describe how stressed I was managing all my citations and making sure they were in the right format. The last thing you want to do is break the academic conduct code by committing plagiarism! Thankfully, creating and managing citations has been made easier after using ReadCube’s citation tool: SmartCite. This tool allows you to generate, format, and manage citations from your ReadCube library and any article available on PubMed. From the the articles stored in your library, you can insert citations into your paper that you’re writing on Microsoft Word. Double tap the CTRL button on your keyboard to bring up SmartCite, type to search for an article, and select the article(s) you want to insert as a citation. Afterwards, you can add and format your bibliography in more than 500 styles! There is also the option to customize and add your own citation. If you can’t find what you’re looking for in this PDF article, then you can use the built-in search function to search through Google Scholar and PubMed. You can search within ReadCube for specific authors, journals, years, or keywords. Once you find your article, you can download it from the web with a click of a button (as long as it is a journal that UConn is subscribed to)! Once your article is added to your library, it becomes full-text searchable. This means you can search multiple articles in its entirety, all at once! The less time you spend searching for articles, the sooner you can finish your paper (and get to do other things like go to the gym, eat, sleep, or Netflix). How Can I get ReadCube? For students who use text-to-speech programs, ReadCube is compatible with screen readers. For example, CSD offers a software called Read&Write to all UConn students: It is a customizable toolbar that integrates reading, writing, studying, and research support tools (learn more about Read&Write). Both Read&Write and ReadCube can be opened simultaneously. To read an article that is opened on ReadCube, use the “Screenshot Reader” button and drag the mouse around the text you wish to have read aloud. This entry was posted in Tech Blog and tagged Android, App of the Week, Assistive Technology, Computer, Free, iOS, Mac, Mobile Devices, Organization, PDF, Productivity, ReadCube, Reading, Research, Windows.